View More In Arch Supports - Page 7. KidSole's Orthotic insoles have been designed to serve as one of the most comfortable pairs of orthotic insoles ever made. Our insoles are tailor made for children and designed promote healthy growing feet. When a child reaches the age of 6-8 their feet might begin to develop high arches which can potentially cause pain. 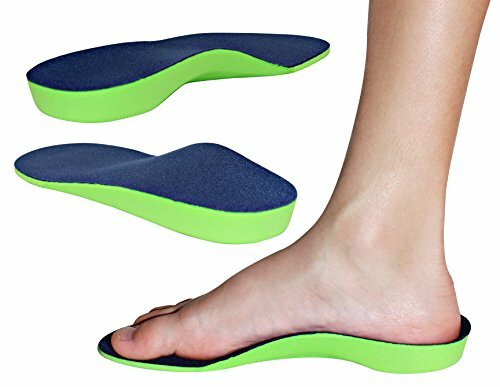 Unfortunately, standard insoles that come with most shoes are typically cheap, poorly made, foam cutouts that don't offer much comfort or support and can often times cause harm to growing feet. KidSole's Orthotic insoles are the perfect fix for a young person with growing feet. Our insoles are designed to cushion the arch and provide relieve to the heel and front of the foot. Our Orthotic insoles are designed to mold to your child's foot over time as they wear them. This ensure the perfect fit for their foot for maximum daily comfort! Our insoles provide proper form and help with natural arch development and aid in pronation. Our insoles will fit in almost any pair of shoes whether they're tennis shoes, dress shoes, or athletic shoes. Our insoles are podiatrist recommended because of how fast a child's foot can develop. Our insoles serve as an investment in the future of your child's foot health! Revolutionary new soft & sturdy step material drastically increases Orthotic comfort. Currently come in 4 sizes. 20 CM fits US Kids Shoe Sizes: 12-1.5; 21CM fits US Kids Shoe Sizes 2-2.5, 22CM fits US Kids Shoe Sizes 3-4 and 24CM fits US Kids Shoe Sizes 4-6. KidSole Orthotic Sport Insoles are designed to mold over time to fit each unique foot. Kidsole Sport is a perfect resolution to heel pain and arch pain for active children with flat feet. If you have any questions about this product by KidSole, contact us by completing and submitting the form below. If you are looking for a specif part number, please include it with your message.